Some businesses are extremely vulnerable to cyberattacks because of the data servers and networks that they rely. This could result in financial loss to the businesses, damages to the system, and challenges to their credibility. With the growing dependency on technology, there are no industries or businesses that are safe from attack; the higher the dependency on online technology, the higher the scope of vulnerability. Therefore, industries working closely with online tools and technologies and are involved with personal information of individuals are more likely to face cyber threats than those which are less exposed to such detail. Financial institutions and banks have now moved their data to cloud servers which have made them even more vulnerable to cyber threats. With the industry being an obvious target, as it deals with a lot of personal information of the users, cyberattacks are becoming more sophisticated. The NCC Group on global cybersecurity and risk mitigation has observed that there is almost a 400% rise in the number of security vulnerabilities in the finance industry! The introduction of the online wallet has intensified the number of hacks by creating multiple entry points for cyber attacks. The attackers motive is to gain access to the credit card information, transfer funds, file fraudulent tax returns, etc. to create panic. News channels and media agencies usually focus on larger cyber attacks on companies like Netflix, Bitcoin, Target, Yahoo, etc. They don’t concentrate on small or medium-sized organizations assuming that the impact of such attacks is less. What will be the consequence of loss if a business is hacked repeatedly? On the contrary, small businesses are frequently hacked due to the lack of effective tools, processes, people and fiscal ability to combat such cyber attacks. Research has also shown that small and medium sized businesses tend to take for granted that cyber-attack victims are from larger institutions. Government agencies are a reservoir of confidential information, including, retina picture, fingerprints, contact details, social security numbers, licenses, bank details, and more. 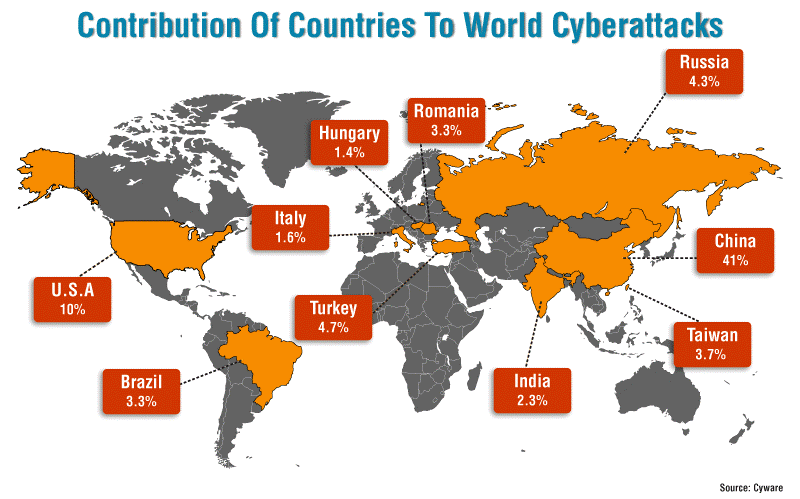 This sector has, therefore, become vulnerable to cyber attacks. Unfortunately, the government agencies don’t receive enough funds to raise their security standards against cyber attacks. Shadow Brokers, a hacking group, breached the NSA (National Security Agency) in 2016. The breach was done to bring the focus on the practices of gathering intelligence through bugs in commercial products and not notifying the manufacturers of the software. The experts identified that the code though outdated was genuine and was used in producing the N.S.A.’s custom-built malware. This practice can be potentially dangerous to billions of software users. Media and entertainment firms are vulnerable to cyber threats due to the extensive use of complex processes and high-profile products, and dealings with various government personnel of repute. Most commonly, the media and entertainment industry face the threats of phishing and malware attacks due to political reasons and not really for criminal or financial intentions. The owners of the manufacturing companies are not really aware of the high risk of cyber attacks and hence they are more vulnerable to cyber threat. These organizations don’t practice adequate defensive measures to safeguard their data. The hackers can easily exploit the vulnerabilities of the manufacturing companies and can demand ransom money by holding their data hostage. They can also sell the valuable proprietary information to others for monetary benefit. The new techniques of cyber attacks will be introduced by the attackers to make the processes vulnerable. If the security protocols are not in the place, then the breach of data will be the resulting outcome. Employee training or hiring of professionals in cybersecurity are the key elements to control the breaches. Cybersecurity in itself is an entire subject and to contrivance it, one must have professional skill and knowledge. We have seen that cyber attacks are rising and only the regular practice of cybersecurity in organizations can overcome the vulnerabilities to a large extent, the need for qualified cyber training should be made mandatory. If you are enthusiastic about learning information security, you can refer to our Bachelor of Science in Cybersecurity and Master of Science in Cybersecurity programs. Our degree programs bring the latest industry knowledge to the students, with a practical approach to learning through our virtual labs – iLabs. Our students also have the opportunity to earn up to four industry-recognized certifications with their degree. Hi, I do think your website may be having internet browser compatibility problems. When I take a look at your site in Safari, it looks fine however, when opening in Internet Explorer, it has some overlapping issues. I simply wanted to give you a quick heads up! Apart from that, fantastic site!